t frame are blue and gold in multiple places. Don't worry about the paint color, unless its original paint its just a colored protective coating. Its your hot rod so paint it whatever you like. Can you post more pictures showing the whole kart. The more the better will help in the identification. Take the seat cover out also and show the seating area, along with the front end, and back end. 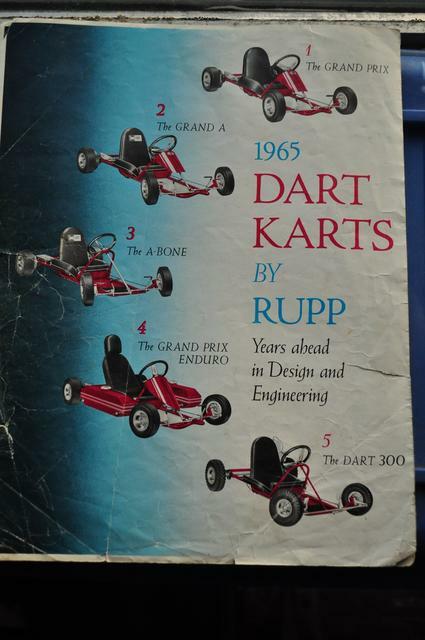 From the looks of it your kart Rick it is a Grand 'A' which was a one year only chassis in 65 if memory serves me right. Its interesting to note that aside from the steel seat and aluminum floor pan it only had one motor mount tab from the factory. Personally I would remove the added front axle supports also. 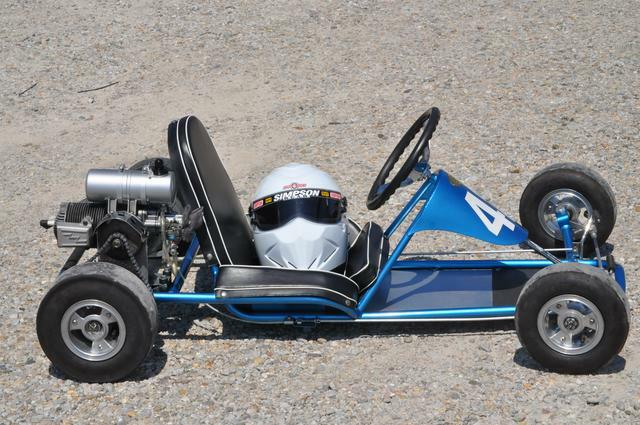 Great karts that handle well, I have one rolling on Azuza wheels. Whoever has the blue 1965 grand a please send me more detailed pics of the frame to my email. I'd be interested in seeing the welds and what is and is not suppose to be on my frame. Using it as a reference as a restoration guide. Thank you. I believe there was also blue and gold karts available also in 1965? My frame shows signs of being gold originally. Factory literature from 1965. Karts were red. Interesting to note that the advertising department didn't know that this was a one year kart and made the statement that it was a proven performer for years. Look at the welds on your chassis where the main frame rails meet the front axle and where the bumper meets the front axle. That will give you the best idea what the welds look like.